A little note about a lesser known but equally bonkers form of woo. The European College of Bowen Studies provides most of the information below. From the description, Bowen looks like a very low impact massage-like technique. The technique involves the therapist using fingers or thumbs to move over muscle, ligament tendon and fascia in various parts of the body. A look at the video shows how very low impact this is – it really looks more like the “laying on of hands” than anything else. Of the 5 peer reviewed pubications about BT, only 4 relate to the efficacy of the technique, and those are all arm-wavey non/poorly-controlled subjective pilot studies from which no reliable conclusions can be drawn. I was particularly interested in the claim that BT can alleviate asthma symptoms – being mildly asthmatic myself, and having a son who suffers (from time-to-time) with severe asthma attacks. In the risable “research” section of the website, there is a page about Asthma – it contains an article reprinted from the Times which looks more like an advert than a serious peice of journalism. The major woo is centred around the assertion that “The body knows how not to have asthma, so you just need to find ways to help it not to be triggered to have an asthma response.” Okaaaaaaay. it can be very effective in managing the condition. Many patients, particularly children, report that they found relief with the technique. O rly? That looks a little dangerous to me. The back-covering addendum also helpfully states that the National Asthma Campaign advises ” patients to consult their GPs beforehand and always to continue to take their medication”. Which is of course completely contrary to the pro-bowen anecdote/article above. CAN BOWEN BE EXPLAINED BY SCIENCE? The basic idea of drawing the brain’s attention to a problem then allowing the body to heal itself does not fit in with a conventional view of physiology. It’s likely that working with a kindly, interested therapist will make anyone feel better, but it’s harder to explain the reported emergency asthma treatment and frozen shoulder studies in this way. Basically… NO, it’s placebo innit. The article is reckless and dangerous. The addendum probably just about saves it from being actionable under ASA guidlines. Cajoling asthma sufferers to leave steroid inhalers at home, and rely on an unproven “emergency move, which involves pushing your thumb into the soft stomach area” really is very irresponsible. If you have asthma, or have witnessed a full-on asthma attack – it’s really quite scary stuff. One of the many claims that Homeopathy makes is that of the “Similia Principle” or “like cures like”. It is this principle by which a homepath selects a remedy: Patient presents with symptom X. Compound Y causes symptom X. Give patient an ultramolecular dilution of compound Y to treat symptom X. They then document some experiments in which cells that are exposed to a high dose of “stress” (heat shock, or toxic compounds such as Arsenic or Cadmium) cope better with and react more intensly to a subsequent low dose of stress. Why this is surprising, I do not know. Adaptive responses and/or preconditioning of cells (both prokaryotic and eukaryotic) is well researched. A pubmed search for adaptive response generates over 17000 hits, for preconditioning over 8000. (correct as of Jan 29th 2010). On a cellular/molecular level, this can be explained by more rapid production/activation of certain stress response proteins, such as heat shock proteins and protein folding chaperones – proteins which attempt to either prevent or reverse that damage caused by whatever stress factor is currently blighting the cell’s ability to proliferate and survive. The more rapid response to the second exposure to stress might be as a result of residual levels of certain transcription factors or activators within the cells. This is not explored in the paper. Another possibility is that the cells that survived the initial high dose of stress are intrinsically better able to adapt to the stress, either as a result of mutation or cellular niche or various other arm-wavey possibilities. The first assult with the stress causing compound has naturally selected for those cells with a better chance of survival – this is the basis of something called “Evolution.” Google it. I’m told It’s quite popular. At the level of an organism, this is basically describes an immune system. An organism is confronted with a “stress”. The organism develops a response (e.g antibodies) to the stress. Next time the stress is encountered, response molecules are quickly produced in massive quantities to prevent damage from stress. Surely everyone saw this graph in GCSE/’A’-level biology? It’s the basis by which all vaccines work, and how multicellular life responds to any sort of antigen. Very basic stuff. Hence It was taught at GCSE level (at least when I sat GCSE Biology in the early 90s). This paper, however, does things differently – high dose first, then low dose – and seems to find some extra significance in this. Why? The relative sizes of the doses are immaterial, as long as cells/organism survive, it is now primed to respond to a second insult. IMHO, a more interesting study ( at least on a cellular/molecular level) would be how long does this “priming of the system” last? Does that time correlate in any way with known half lives for mRNA, transcription factors, phosphorylation of various proteins? Is this persistence of this effect related to the size of the initial insult? This is not commented on. Figure 1 is a nice little diagram of their experimental design. Fig 1 from here – used without permission, but fair use claimed. Low dose, high dose, evaluate. Low dose, no treatment, evalute. I imagine that this has been done before – and if I was feeling mean I might suggest that the results maybe very similar to the “high dose/low dose” regimen, and have been ommited – but irrespsective of this – one needs to replicate this in your experimental design as a control. Ooops. But that’s really nitpicking – important nitpicking, IMHO, but nitpicking nevertheless. They then go on to use these observations to support the basic tenets of homeopathy. <Screeeeeeech> <double take> Woah there! Did I miss something? All these experiments are done with actual measurable amounts of compounds present (10uM, 0.3uM – handy, easy to understand concentrations like that). Unlike homeopathic remedies. When treating someone with a homeopathic remedy, the patient will persumably be taking the *cough* low dose1 *cough* at the same time as he/she is suffering with the effects of the high dose (note – Homeopathy treats symptoms, not causes – so it is easy to see how they might overlook this). So even if the concept of hormesis is real and valid in this context (and there is some controversy about that) what is the biological mechanism by which this occurs? After all a very big number plus a very small number is still a very big number – how does the body determine which compound is for what purpose? This support of homeopathy is realised though some arm-waving about “postconditioning hormesis” – sadly not ultra-diluted molecules administered after the onset of the symptom travelling back in time to pre-condtion the body before the onset of the symptom and confer partial-immunity, thus helping the patient get better back in the future. We have a reference to postconditioning in the context of myocardial infarctions – and a reference to a paper which seems to do a decent job of describing postconditioning and then going on to have a stab at getting some clues about the mechanism by which the postconditioning limited the damage caused by the previous myocardial infarction. So postconditioning – fine – plenty of evidence for that in certain contexts. And then there is reference to hormesis – where giving a small dose of something gives opposite effect of large dose – ok – fine – some examples of that in the literature, (e.g. in context of aging,) but with a caveat that whilst it is an interesting hypothesis, predictions made on the basis of hormesis are not suitably accurate for directing health care choices, policy etc. Stitch the two together and “POSTCONDITIONING HORMESIS” is born. Orginally toted in this paper – postconditioning hormesis is a strange and intriguing effect – but you can imagine how it might work – low levels of non-damaging stress shortly after major damaging-stress prolong the synthesis/activation of response factors that aid recovery and limit damage – i.e. it is explainable by current scientific thinking – as long as one believes in such vagaries as “avagardos constant” and what have you. Given that it involves a beneficial small dose been given after stress caused by a toxic high dose, it is perhaps not surprising that Homeopathy has lept upon postconditioning hormesis as a potential mechanism through which it might work. A google search of “postconditioning hormesis” reveals that 6 of the 10 hits on the first page also mention homeopathy. Peter Fisher, the UKs homeopath-in-chief, even mentions it in his lectures now. However in jumping on the postconditioning hormesis band wagon, Homepathy has seemingly bypassed other, more thorny issues like the mechanism of succussion, lack of evidence for the “memory of water” and the subsequent “memory of sugar” and the molecular mechanism by which this memory is realised in the context of binding to receptor molecules, not-to-mention the ever present “lack of efficacy beyond placebo effect” issue that it suffers from. 1 By “low dose”, I of course mean “no dose” – a ultra-dilute potentized solution containing zero active molecues – other than the water and the impurities within. With the memory of the original high dose molecule… transfered to a sugar pill. Got that? Both followers of this blog (Hello Mum!) may remember THIS post, where I discovered homeopaths on THIS website were citing THIS article in the BMJ (De Lange de Klerk et al, BMJ 1994; 309: 1329–1332) that found that “Homoeopathic medicines produce no clinically relevant improvement” as proof that homeopathy works. Maybe they hoped that people would see the title in the citation (Effects of homoeopathic medicines on daily burden of symptoms in children with recurrent upper respiratory tract infections), and assume that paper does indeed support homeopathy. So, not a paper that conclusively shows any proof of efficacy for Homeopathy*. So I thought it might be fun (think what you will of my definition of ‘fun’) to do a little digging and see in what other contexts this particular reference was cited. According to Scopus our paper is cited in 48 scholarly articles.There are some rather interesting ones in and amongst those 48. Let’s take a look at three of them. Our reference is number 206 in that lot. And our reference was significant all right – if I can just remind you – “Homoeopathic medicines produce no clinically relevant improvement in recurrent upper respiratory tract infections” & “The small difference in the mean daily symptom scores in the treatment and placebo groups was not significant (P=0.06 or 0.07 after correction for baseline differences).” – this would appear mutually exclusive with “clear evidence of efficacy in favour of homeopathic treatments that cannot be attributed only to a placebo effect”. Hmmm. In this paper, our reference, (55) is cited in table 1 in a group of 47 papers that “observed a homeopathic effect superior to placebo.” Just remember this is a paper that clearly states “The small difference in the mean daily symptom scores in the treatment and placebo groups was not significant (P=0.06 or 0.07 after correction for baseline differences).” Confused? You should be. 3) Antibiotics and the development of resistant microorganisms. Can homeopathy be an alternative? Once again – the original paper contends that the differences between placebo and homeopathy were not significant – Viksveen says otherwise, but then in the sentence after that, quotes verbatim the negative results for homeopathy in the study. WTF? The vast majority of the 48 papers that cited De Lange de Klerk et al, cited it correctly – to indicate that this particular study has not shown that homeopathy is really effective beyond placebo, or more research is needed in this area. The three I have gone into more detail about have (pretty much) taken the exact opposite conclusions from the paper. The eagle-eyed amongst you will have spotted that all 3 of these papers come from the Journal “Homeopathy”, the organ of the Faculty of Homeopathy. The members of the editorial board / advisory board of Homeopathy can be found here. But wait? What’s this? Of our three papers who cite De Lange de Klerk et al as positive proof for the efficacy of Homeopathy above that of placebo effect, 2 are authored by members of the Homeopathy editorial board? Shurely Shome Mishtake? (Michel van Wassenhoven – on the Editorial Advisory Board, RT Mathie on the Editorial Board). The author of the 3rd paper, Petter Viksveen is a practising homeopath, working in Norway, and a graduate of the fine MSc Masters Degree in Homeopathy, which was until recently awarded from the University of Central Lancashire. Anyone interested in the course materials for that degree course can of course see them on David Colquhoun’s excellent blog. The fact De Lange de Klerk et al has been erroneously cited 3 times by the same journal demonstrates a failure of the individual authors concerned to correctly reference and source their work, and a repeated failure of the reviewers and editors of Homeopathy to spot such an obvious error. I leave the reader to make his/her own conclusions about the quality of the peer-review process at Homeopathy. It is interesting to note that publishing house Elsevier (who publish and distribute Homeopathy) have signed up to the committee for publication ethics, COPE. Of all the qualities a good scientist must have, intellectual honesty and rigour are paramount. Any scientist worth his Natrum muriaticum would have at the very least, skimmed though any paper he is citing – certainly he will be aware of the major conclusions that a paper draws. To do otherwise is neither intellectually honest nor intellectually rigorous. Given the format of De Lange De Klerk et al, even when viewed alone the abstract gives a really big hint as to the conclusion of the paper: (hint – look at the words after “Conclusions”) – it is really exceptionally difficult to avoid the conclusions this paper makes. I cannot conceive of a situation in which a professional scienist could cite a paper to support a hypothesis which is the opposite of the conclusions of the cited paper, without being either woefully negligent or intentionally duplicitous. Given the credibility problems that homeopathy has in the scientific community, if homeopaths are to obtain evidence that is irrefutable and universally accepted, their actions must stand up to close scrutiny – after all “remarkable claims require remarkable evidence”. The examples above fail to stand up to such scrutiny. I might add that it did not take me very long to find this out – I have looked at 1 paper, cited 48 times and found 3 egregious errors. Have I been lucky enough to stumble upon the one paper that has been so erroneously cited? Or are there more examples out there? *I am not commenting on the accuracy of De Lange de Klerk et al (there are a couple of letters to the BMJ from Peter Fisher amongst others complaining about the stats/methodology in this paper) – that is NOT the point I am making here. The fact is that this paper clearly and unequivocally concludes that “Individually prescribed homoeopathic medicines seem to add little to careful counselling of children with recurrent upper respiratory tract infection in reducing the daily burden of symptoms, use of antibiotics, and need for adenoidectomy and tonsillectomy.” The paper has NOT been retracted, neither has anyone published a re-analysis the data, as far as I can see. If either were the case, one would cite the re-analysis or the retraction – not the original paper. This article was posted on twitter under the #ten23 hashtag today by a homeopath (who shall remain nameless), who perhaps thought that this was good evidence to cite for homeopathy being superior or at least preferable to conventional treatment of bacterial infection by antibiotics. Research shows that homeopathy can serve as an effective alternative to antibiotics in a range of infectious conditions for which they have been commonly used5-13. WOW! – look at that – “5-13” – that’s 9 references to back up 1 point – must be an important one! 5. Adler M. Efficacy, safety of a fixed-combination homeopathic therapy for sinusitis. Adv Ther 1999; 16: 103-111. “Sinusitis often clears up by itself, and about two thirds of those who get the condition do not need to see their GP. On average, sinusitis takes about two-and-a-half weeks to clear. So, the NHS say that on average, sinusitis will sort itself up after 2 and a half weeks, and the majority of sufferers do not need to see a medical practicioner. In the homeopathic study – 100% of sufferers saw a homeopathic practioner, and 81.5% of them were better than significantly improved after treatment. So no improvement on no treatment at all. Hmm. 6. De Lange de Klerk E, et al. Effects of homoeopathic medicines on daily burden of symptoms in children with recurrent upper respiratory tract infections. BMJ 1994; 309: 1329-1332. CONCLUSION–Individually prescribed homoeopathic medicines seem to add little to careful counselling of children with recurrent upper respiratory tract infection in reducing the daily burden of symptoms, use of antibiotics, and need for adenoidectomy and tonsillectomy. Homoeopathic medicines produce no clinically relevant improvement in recurrent upper respiratory tract infections. Hang on a minute – the homeopaths are actually citing a paper which concludes “homoeopathic medicines seem to add little…” to try and bolster the case for homeopathy as an effective therapeutic strategy? Either someone didn’t read this paper, or someone didn’t think that someone else would read this paper. I believe “FAIL” is suitable internet vernacular for an occurance such as this. 7. Frei H, Thurneysen A. Homeopathy in acute otitis media in children: treatment effect or spontaneous resolution? Br Homeopath J 2001, 90: 180-182. Another disease where sponaneous resolution is a factor. Treatment of the disease is not relevant in this case, as the study looks a pain management. A notorious placebo mine field. However – I can’t find the full text of the paper to comment on how the study was conducted. If you have a .pdf of this – leave a comment and I’ll get in touch. EDIT: Tom Johnston kindly provided me with a copy of this paper. 8. Friese K-H, Kruse S, Ludtke R, Moeller H. Homeopathic treatment of otitis media in children: comparisons with conventional therapy. Int J Clim Pharmacol Ther 1997; 35: 296-301. I finally tracked down the .pdf of this paper (I can send it to anyone who wants a copy – add a comment below) – and it is a curious paper. those 2 groups being homeopathic treatment and antibiotic treatment. They also note that 5 children involved in the study took antibiotics after homeopathic treatment – but apparently, any comment on that would be “beyond the scope of this article” O RLY? a trial that compares treatment with antibiotics versus treatment with homeopathic remedies seems utterly pointless. A placebo controlled study is clearly required. 9. Jacobs J, Springer DA, Crothers D. Homeopathic treatment of acute otitis media in children: a preliminary randomized placebo-controlled trial. Pediatr Infect Dis J 2001; 20: 177-183. Oh look! A randomized placebo-controlled trial! CONCLUSIONS: These results suggest that a positive treatment effect of homeopathy when compared with placebo in acute otitis media cannot be excluded and that a larger study is justified. D’oh! So close, and yet so far. 10. Riley D, Fischer M, Singh B, Haidvogl M, Heger M. Homeopathy and conventional medicine: an outcojmes study comparing effectiveness in a primary care setting. J Altern Complement Med 2001; 7: 149-159. Hmmm – one thing we can all take home from this is that Google Scholar is much better at finding papers in obscure alternative med journals than PUBMED – can’t think why. The full text of this paper lives here. the information from this study will improve clinical trial design in the real world medical setting and offer a better understanding of how homeopathy and other alternative medical therapies are and can be integrated into the practice of medicine. (1) upper respiratory tract complaints including allergies; (2) lower respiratory tract com- plaints including allergies; or (3) ear complaints. No mention is made in the paper of what conventional therapies (antibiotics?) were used, what the actual diseases were (i.e. were they diseases that spontaneously resolve anyway) – so it is impossible to draw any sort of conclusion about this paper. No placebo control was used (unethical in primary care setting, I guess). 11. Steinsbekk A, Fønnebø V, Lewith G, Bentzen N. Homeopathic care for the prevention of upper respiratory tract infections in children: A pragmatic, randomised, controlled trial comparing individualised homeopathic care and waiting-list controls. Complementary Therapies in Medicine 2005, 13, 231-238. This paper lives here (you need to pay or have access) – has a small sample size (169) and, again, does not look at specific diseases and therapies. There is no placebo control. But, as this was a pragmatic study, it provides no evidence to sustain an argument that homeopathic medicines have specific efficacy. 12. Weber U, Luedtke R, Friese KH, Fischer I, Moeller H. A non-randomised pilot study to compare complementary and conventional tretaments of acute sinusitis. Forsch Komplementarmed Klass Naturheilkd 2002; 9: 99-104. Conclusions: Both treatments appear to be equally effective (or ineffective). Results might be biased because both treatment groups differed substantially. Randomised trials including at least 400 patients are needed to produce valid results. ‘ 13. Wiesenauer M, Gaus W, Bohnacker U, Haussler S. (Efficiency of homeopathic preparation combinations in sinusitis. Results of a randomized double blind study with general practitioners.) Arzneimittelforschung 1989; 39: 620-625. The abstract can be found here. The full text of this paper is not available online. there was no remarkable difference in the therapeutic success among the investigated homeopathic drug combinations nor between the active drugs and placebo. Once again, the “homeopathic” rememdies were not at sub-avagadro’s concentrations. 1 paper is openly dismissive of the clinical relevance of homeopathy. 4 of them admit that they are looking at diseases which normally resolve without medical intervention anyway *. So when someone shows you something with a list of references to support their claim – make sure you look at the references! Because people WILL use references that say the exact opposite of what they are saying in the hope that you won’t bother reading them! finished Cochrane reviews of Homeopathic treatment. Summary > Current evidence does not support a preventative effect of Oscillococcinum-like homeopathic medicines in influenza and influenza-like syndromes. homeopathic dilution. D6 is equivalent to 1 part in a million. Thank you for writing to me about EDM 423 and libel law reform. I understand your concerns on this issue. It is important that those who contribute so much to research and culture in this country do not feel restrictred from publishing interllectually challenging and informative articles. Fear of libel action should not curb debate by scientists, academics and journalists. Freedom of expression is the hallmark of a free society and must be strongly protected. If libel cases do succeed, the costs are often so crippling to defendants that even large newspapers are in diffculty in resisting some claims. It is evident that Britain has become an attractive place for individuals to bring about specualative libel action since lawyers will often bear the brunt of the costs in exchange for potential awards available to winning litigants. I do believe, however, that we must be careful when changing libel law itself. People have the right not to be defamed unless necessary, and changes to this law should not risk this principle. I believe that the burden of proof should remain on individuals who make defamatory claims about other people to justify their asertions about others. For this reason, I do not feel that I can sign EDM 423. Let me assure you that my colleagues on the Shadow Justice Team will continue to press the Government on this issue, to ensure that any changes to the law adequately protects individuals without placing too great a burden on, for example, scientists, academics and journlists. Thank you for taking the time to write to me. …while individual reputation is protected against malicious or reckless smears, lawful free expression is not chilled and there is a fully effective public interest defence for both scholarship and responsible journalism. The Molecular Mechanisms of Homeopathy. With the launch of the 1023 campaign against homeopathy, it seems appropriate for me to write a bit on that very subject. But where to start – there are so many blogs that talk about the issues that people have with homeopathy. The ethical reasons for campaigning against it and the slap in the face that homeopathic “medicine” is to scientific thinking have been subject to in-depth coverage. Recently Prof David Colqhoun has finally gained access to teaching materials for a now-defunct BSc in Homeopathy, via a freedom of information request. He is reviewing them systematically on his excellent DC’s improbable science blog. So with all this covered by other, more eloquent and seasoned bloggers than myself, I have decided to look at homeopathy from my own niche in science – from a structural/molecular biologist’s point of view. To understand the issues that science has with homeopathic “remedies”, one needs to know how conventional drugs work. They work by interacting with another molecule in your body. Generally they will either activate or inhibit the activity of protein molecule that is involved in some sort signal transduction pathway, or in the catalysis of a particular chemical reaction. Structural biology, particularly X-ray crystallography is an immensely powerful tool for understanding the nature of these drug: receptor interactions. For example, crystallography has revealed the nature of interactions between a bacterial ribosome and the antibiotic chlorampenicol and HINI (Swine flu) neuraminidase interaction with anti-influenza drug, Tamiflu. These structures reveal the nature of the interaction at an atomic level. We can see Electrostatic interactions (negatively charged atoms/groups interacting with positively charged atoms/groups) such as salt bridges and hydrogen bonds. We can see aromatic stacking interactions (aromatic groups stacking alongside each other) and other hydrophobic interactions. We can precisely map out the atomic nature of an interaction. Such information is invaluable in understanding how a drug works. We don’t have this information for every single drug that is used. But in time we will. A “conventional” drug, eg Tamiflu, consists of a chemically defined active ingredient at a known and measurable concentration. Each adult dose of Tamiflu contains 75 mgs of Tamiflu. Given that Tamiflu has a molecular weight of 312.4 g/mol, each 75mg dose of Tamiflu contains 1.4×1020 (~140,000,000,000,000,000,000) molecules of Tamiflu (0.075/312.4 * Avogadro’s constant). Your body takes up a known percentage of this drug – this is known as “bioavailability”. In the case of Tamiflu, the bioavailability is ~60% – so of the 1.4×1020 molecules of Tamiflu that you swallow, only 8.6×1019 get into your blood stream. These then circulate for until broken down/excreted. Tamiflu works by mimicking the natural substrate of influenza virus neuraminidase, sialic acid. By preventing influenza virus neuraminidase binding to endogenous sialic acid presented on the surface of your cells, Tamiflu prevents infection of host cells. Simple. Homeopathic remedies are based upon highly dilute samples of a compound that causes a similar effect to the symptoms of a given disease (“like cures like”). For example, if disease X gives me hiccups, and plant extract Y gives me hiccups, I would take a dilute solution of plant extract Y to cure the symptoms of disease X.
We’ll overlook the fact that this is treating a symptom (by causing it? ), and not addressing any underlying cause – because homeopathic remedies are “potentised” during their production. The originator of homeopathy was Samuel Hahnemann, who described a process whereby the effect of these cures could be enhanced by serially diluting them until one reached ultra low concentrations. Each dilution step would be accompanied with “succussion” of the solution – ten hard strikes against a soft, often leather-covered object. The wikipedia page on Homeopathy has a good description of this process. A typical homeopathic remedy has a concentration of 30C, that is to say, 1 part compound in 10030 (so 1060). After Hahnemann first devised homeopathy, Avogadro’s constant (number of molecules in a mole of substance) was calculated, and shown to be roughly 6×1023 (hence 1023 campaign). So in a 1023 or 11.5C solution one might reasonably expect to find 1 molecule of compound. The odds of finding a single molecule of active compound of a 30C homeopathic remedy are very roughly 1 in 10,000,000,000,000,000,000,000,000,000,000,000,000 (10 million million million million million million). When this was pointed out to the homeopaths (that their remedies had zero active ingredients) they happily discovered that the water in which the active ingredient was dissolved in had a memory and not only remembered the active ingredient (doubtless both its molecular structure and pharmokinetic properties), but the water could also pass this memory on to other water molecules. Cool, huh? Note – the succussion process allows the water to remember the therapeutic ingredient, but not all the other stuff that the water has seen down the years. And given that a molecule or two of the water currently in the coffee I am drinking were likely to have at sometime been intimately associated with an Ebola virus particle or a molecule of the Ricin toxin – I sincerely hope this is the case. The molecular mechanism of succussion, and how it selects for particular solutes, is currently not understood. But in order for a homeopathic remedy to work, not only does the water need to retain a memory of the active ingredient, it needs to actually mimic it, so it can then interact with the required target molecule to exert an effect. It has to adopt a similar/identical form. The grey surface represents the molecular surface of a particular protein I’m working on. 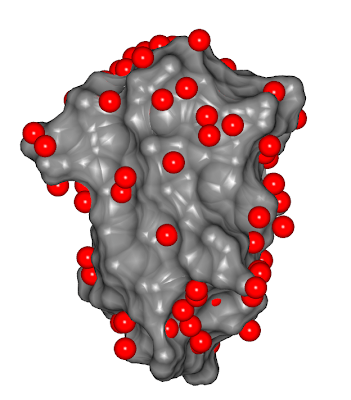 The red spheres represent ordered water molecules that interact with the suface of the protein. We see these bound water molecules in pretty much every crystal structure we solve, as the vast majority of crystals are formed from aqueous solutions. Indeed, water molecules can become trapped inside proteins and help them fold correctly and bind substrates or metal ions. Water molecules also participate in chemical reactions – often being split to protenate leaving groups. So the idea that water adopts a structure around another molecule is not that far fetched. So, being inquisitive, scientists tried to determine if this water structure persisted after the molecule was removed. And to their surprise, it did – but for only ~50 femtoseconds (0.00000000000005 seconds – not very long at all – and not much use for a remedy that’s going to sit on the shop shelf for weeks). For the sake of further enquiry, let’s assume that the peer-reviewed letter to Nature above is wrong (it isn’t), and water can retain a memory of what’s been dissolved in it for much longer than 50 femtoseconds (it can’t). This isn’t enough – an empty shell of water molecules around a compound that was once there isn’t going to be enough to interact with and engage protein receptors – they actually have to then rearrange and mimic the chemical and physical properties of the molecule that induced the formation of that shell in the first place. Not only this – this water structure then has to be robust enough to occupy a protein-binding site and fend off other molecules that might normally bind to that site with a high affinity – molecules that will displace water molecules all the time in order to get into that very binding site. The original therapeutic molecule will not only have a particular shape and form – it will have an inherent stiffness and rigidity – water molecules in solution move relatively freely and will shift to surround any molecules dissolved it them – that is why water is such an excellent solvent. But not homeopathic solutions. Oh no. In order to circumvent this, the energetics of homeopathic remedies must be amazing – water molecules typically interact with each other via low energy, transient “hydrogen bonds” – each hydrogen bond requires 5-30 kJ/mol to break it (depending upon solvent conditions, temperature, etc), but a permanent “covalent” bond that links atoms in a drug molecule typically requires over 300 kJ/mol to break it – i.e. at least over 10 times stronger. And yet the homeopathic shell of water molecules manages to be as strong as this. Utterly fantastic stuff. The properties of homeopathic solutions are beyond comprehension – and to think that all this was achieved by diluting something to a point where no original molecules remain whilst periodically banging it on something leathery. It is the fantastic and unbelievable nature of homeopathic remedies that leads scientists to question their validity as an effective form of therapy. Experiments to investigate this show that homeopathy is no more effective than placebo. When a therapy has no active ingredient, no conceivable mechanism of action, and cannot be demonstrated to be more effective than a placebo, to claim otherwise is both dangerous and immoral. It certainly has no place whatsoever in a public funded health service like the NHS. You are currently browsing the Anomalous Distraction blog archives for January, 2010.